[Click HERE to be taken to Rich's Forum] Hi, my name is Rich (Also goes by 'choppin' on the forum). I have been fabricating forward controls and selling them on Face Book, and also on Virago Tech Forum. This is a bolt on kit. Highway bars must be removed for the attachment. The kit will fit all 700 thru 1100 models. Will not fit the 535"s and smaller. The cost is $275.00 plus shipping. I use PayPal for the transactions. If any question's please PM me (choppin) for more details. I will begin shipping the 535 forward controls in April. Anyone interested please message me and I can get you all of the details. These set's come complete and will sell for $275 plus shipping. 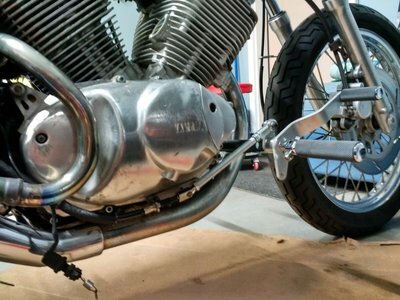 Yamaha Virago TCI Ignition Module Reconditioning Service.